In Elie Wiesel's memoir Night, a pious teenager is guilt-ridden because he survived the Nzai death camps, and yet his family was killed. He questions his faith, the loss of his innocense, and the nature of evil that can allow such genocide to occur. Elie Wiesel was awarded the Nobel Peace Prize in 1986.
andreaokren (Seymour): A terrifying true account of Elie Wiesel's experience through Nazi terror and concentration camps. Hill and Wang, 1960. Stated First American edition, with first issue dust jacket; rear flap features photo of Wiesel in glasses, no mention of other titles by Wiesel. SIGNED by Elie Wiesel directly to title page, with no inscription. Jacket is unclipped, in protective mylar, with light rubbing to front panel, soiling to spine and top right of rear panel. . Signed by Author. First American Edition, First Printing.. Hard Cover. Very Good/Good. Edition: First American Edition, First Printing. London: MacGibbon & Kee, 1960. 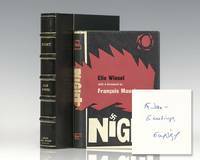 First British edition of Nobel laureate Wiesel's masterpiece. Octavo, original cloth. Presentation copy, inscribed by the author on the front free endpaper, "For John- Greetings, Elie Wiesel." Near fine in a near fine dust jacket with a touch of wear. Jacket design by Cowan. Foreword by Francois Mauriac. Translated from the French by Stella Rodway. Housed in a custom half morocco clamshell box. "If only I could get rid of this dead weight. Immediately I felt ashamed of myself, ashamed forever" wrote Nobel Laureate Elie Wiesel in reference to his dying father. Night relays Wiesel's experience as a prisoner in the concentration camps at Auschwitz and Buchenwald in 1944-1945. Wiesel witnessed the inversion of convention and destruction of values. He writes, "here there are no fathers, no brothers, no friends, everyone lives and dies for himself alone." "To the best of my knowledge no one has left behind him so moving a record" (Alfred Kazin). New York: Hill and Wang, 1960. 1st Edition. Hard Cover. BOOK VERY GOOD+/JACKET VERY GOOD+. 8vo - over 7¾"" - 9¾"" tall. Signed by Author. SIGNED BY THE AUTHOR on a special, decorative bookplate. A CLEAN, ATTRACTIVE COPY WITH A BRIGHT, BEAUTIFUL DUSTJACKET IN NEW, GLOSSY BRODART. NO PREVIOUS OWNER MARKINGS. DUSTJACKET IS NOT PRICE CLIPPED AND SHOWS THE ORIGINAL PRICE OF $3. This is the true first printing of this book -- Black boards, statement of first edition without any numberline, rear of dustjacket contains advance comments, inside rear flap photo shows Wiesel wearing glasses. 116 pages. RARE, COLLECTIBLE, TRUE FIRST EDITION COPY OF THE AUTHOR'S ACCLAIMED FIRST BOOK. London: Macgibbon and Kee, 1960. 1st Edition. Hard Cover. BOOK FINE/JACKET VERY GOOD+. 8vo - over 7¾"" - 9¾"" tall. Signed by Author. SIGNED BY THE AUTHOR on a special, decorative bookplate. AN EXCEPTIONALLY CLEAN, ATTRACTIVE COPY WITH A BRIGHT, BEAUTIFUL DUSTJACKET IN NEW, GLOSSY BRODART. NO PREVIOUS OWNER MARKINGS. DUSTJACKET IS NOT PRICE CLIPPED AND SHOWS THE ORIGINAL PRICE OF 12s6d. Dustjacket is in Very Good+ to Near Fine condition. Interior is exceptionally clean and nice -- with no age toning or foxing which you would normally find in a book of this age. Dustjacket is in great condition and is not missing any pieces. STATED FIRST EDITION. TRULY HANDSOME, COLLECTIBLE COPY OF THE AUTHOR'S ACCLAIMED FIRST BOOK. New York: Hill and Wang, 1960. Hard Cover. BOOK FINE/JACKET GOOD+. 8vo - over 7¾"" - 9¾"" tall. Signed by Author. SIGNED BY THE AUTHOR on a special, decorative bookplate. AN EXTREMELY CLEAN, ATTRACTIVE COPY WITH A DUSTJACKET IN NEW, GLOSSY BRODART. NO PREVIOUS OWNER MARKINGS. Dustjacket is not price clipped. Jacket is slightly shorter than book and shows overall wear. Second printing from 1961. AUTHOR'S ACCLAIMED FIRST BOOK. London: MacGibbon and Kee, 1960. First Edition. Hardcover. Very Good. First British edition, first printing. Foxing, light dust soiling and light wear to edge of page block, else Near Fine. In a Very Good dust jacket, which is foxed and lightly worn. A sharp copy. New York: Hill and Wang, 1960. Hard Cover. BOOK NEAR FINE/JACKET NEAR FINE. 8vo - over 7¾"" - 9¾"" tall. Signed by Author. SIGNED BY THE AUTHOR on a special, decorative bookplate. AN EXTREMELY CLEAN, ATTRACTIVE COPY WITH A BRIGHT, ATTRACTIVE DUSTJACKET IN NEW, GLOSSY BRODART. NO PREVIOUS OWNER MARKINGS. Dustjacket is not price clipped. AUTHOR'S ACCLAIMED FIRST BOOK. London: MacGibbon and Kee, 1960. First Edition. First Edition. Wiesel's classic account of idolatry and the destruction of religious faith during the Holocaust. Very Good plus in a bright, Very Good plus, price clipped dust jacket. Neat contemporary owner name and date (1965) on the front flyleaf. Jacket has no loss, just a touch of toning at the spine panel and some light soil to the rear panel. A bright, attractive copy. London: MacGibbon and Kee, 1960. First Edition. Hardcover. Very Good. First British edition, first printing. Near Fine in a Very Good dust jacket. Bottom corners of rear pages creased. Light soiling to front end paper. Else a very sharp copy in a lightly edge worn, and lightly rubbed dust jacket. Wiesel's autobiographical novel about his experiences in Auschwitz and Buchenwald at the height of the Holocaust during World War II. New York: Hill and Wang, 1960. 1st Edition. Hard Cover. BOOK GOOD+/JACKET GOOD+. 8vo - over 7¾"" - 9¾"" tall. Signed by Author. SIGNED BY THE AUTHOR on a special, decorative bookplate. CLEAN COPY WITH A DUSTJACKET IN NEW, GLOSSY BRODART. Decorative bookplate on front pastedown. Cardpocket has been cleanly removed from rear pastedown. Library markings on three pages. Interior pages are mostly nice and clean. Dustjacket has been tape repaired in several place. DUSTJACKET IS NOT PRICE CLIPPED AND SHOWS THE ORIGINAL PRICE OF $3. This is the true first printing of this book. 116 pages. AUTHOR'S ACCLAIMED FIRST BOOK. London: MacGibbon & Kee. Near Fine in Near Fine dust jacket. 1960. First Edition. Hardcover. Terra cotta boards titled in black. First British edition. Slight foxing to text block edges and endpages, slight toning to pages else a square tight unmarked sharp-cornered copy. The DJ in protective cover has slight soil, flap price of 12s 6d net intact. ; 12mo 7" - 7½" tall . New York: Hill and Wang, 1960. First Edition. Hardcover. Good. First American edition stated, first printing. Good with patch of significant fading to the crown, wear to spine ends, toning and several small stains to pages. In a Fair, heavily worn, tattered and price clipped dust jacket, which exhibits a small pen scribble on the rear panel, a large chip at the head, a split along the bottom of the front spine joint and top of the front flap fold, creasing to the front panel and edge tears. A serviceable placeholder. Wiesel's autobiographical novel about his experiences in Auschwitz and Buchenwald at the height of the Holocaust during World War II. New York: Hill and Wang, 2006. First edition. Octavo, original half cloth. Fine in a fine dust jacket. Signed by Elie Wiesel on the half title page. Additionally signed by Marion Wiesel on the half title page, who served as translator to this edition. "If only I could get rid of this dead weightImmediately I felt ashamed of myself, ashamed forever" wrote Nobel Laureate Elie Wiesel in reference to his dying father. Night relays Wiesel's experience as a prisoner in the concentration camps at Auschwitz and Buchenwald in 1944-1945. Wiesel witnessed the inversion of convention and destruction of values. He writes, "here there are no fathers, no brothers, no friendseveryone lives and dies for himself alone." Hill and Wang, 1960-01-01. First American Edition. Hardcover. Good/Fair . Hardcover with dust jacket. Stated First American Edition September 1960. 1st printing (no later printings indicated). Weisel's third novel, after Dawn and Day. Bookplate on the front end paper. A few faint spots on the edges of the text block. No other markings. Some wear at the top and bottom of the spine. Dust jacket has some edge wear, a few small closed tears and chips. Price intact. Ships in a box. Fast shipping from NYC! Geneva: Bibliophile Library, 1985. Hardcover. Very good+/No dust jacket. Podwal, Mark. Geneva: Bibliophile Library, 1985. Rodway, Stella and Mauriac, Francois. Signed by the author. Numerous b/w illustrations. Illustrated by Podwal, Mark. 199 pp. Hardcover. 8vo. Dark red leatherette. Gilt lettering and decorative stamp to spine and front board. Very good condition. Minor wear on heel and bottom corners. Pages are clean and clear. Very good+/No dust jacket. (Insurance required to ship this item). London: Macgibbon & Kee 1960, 1st British printing. (Hardcover) 139pp. Near fine in near fine dust jacket. In black boards. The spine has a very slight lean and the dust jacket is price-clipped. Foreword by Fancois Mauriac. Translated by Stella Rodway. (Holocaust, Holocaust). UK: MacGibbon & Kee. London, MacGibbon & Kee, 1960. Hardback first edition and first impression. Very good condition, jacket with a little bumping and a couple of short tears to the tips of the spine, rear panel toned and with evidence of a price sticker being removed. One 10mm tear to front fold, a couple of smaller (1-2mm) elsewhere. 20 written on jacket in ink. Boards a little bumped. A decent copy. . Very Good. Hardback. 1st Edition. 1st Printing. 1960. 1981-02-09. New. Ships with Tracking Number! INTERNATIONAL WORLDWIDE Shipping available. Buy with confidence, excellent customer service! Norwalk, Connecticut: Easton Press. 2000. First Edition; First Printing. Hardcover. Fine, Accented in 22kt gold, printed on archival paper with gilded edges, smyth sewing & concealed muslin joints. Bound In full leather with hubbed spines. Pristine. ; Great Books of the 20th Century; 8vo 8" - 9" tall . RB Large Print. Hardcover. VERY GOOD. Light rubbing wear to cover, spine and page edges. Very minimal writing or notations in margins not affecting the text. Possible clean ex-library copy, with their stickers and or stamp(s). 2006-02-02. New. Ships with Tracking Number! INTERNATIONAL WORLDWIDE Shipping available. Buy with confidence, excellent customer service! 1985-06-07. New. Ships with Tracking Number! INTERNATIONAL WORLDWIDE Shipping available. Buy with confidence, excellent customer service! The Bibliophile Library. Hardcover. 0935613005 Hardcover book with faux-leather boards and gold gilt page edges. Appears like never read! Slight scratch to the back cover, otherwise fine condition. Translated from the Hebrew with an Historical Afterword by Neal Kozodoy. . Fine. Geneva, Switzerland: The Bibliophile Library, 1986. Translated from the French by Stella Rodway. Foreword by Francois Mauriac. Leather or faux-leather boards with decorated red endpapers and top edge gilt; with gold and green perimeter elements on front cover, along with gilt-stamped signature of Wiesel; green title band on spine. Reprint. Hard Cover. Fine. New York: Hill and Wang. Very Good in Good dust jacket. 1961. Second Printing. Hardback. Publisher's grey cloth in dust wrapper, second printing, January 1961, dj chipped & edgeworn with slight loss, darkening to endpapers, cloth clean, internally clean, jacket not price-clipped. ; 5.5" x 9"; 116 pages . 1973-09-08. New. Ships with Tracking Number! INTERNATIONAL WORLDWIDE Shipping available. Buy with confidence, excellent customer service! Perfection Learning Prebound, 1977-12-31. Library Binding. Used:Good. The Bibliophile Library, 1973. Book. New. Hardcover. Full deep red Morocco leather binding, bright gilt titles, all edges gilt, silk ribbon marker. 1982-07-07. New. Ships with Tracking Number! INTERNATIONAL WORLDWIDE Shipping available. Buy with confidence, excellent customer service! 1999-01-04. New. Ships with Tracking Number! INTERNATIONAL WORLDWIDE Shipping available. Buy with confidence, excellent customer service! 2004-02-07. Good. Ships with Tracking Number! INTERNATIONAL WORLDWIDE Shipping available. May not contain Access Codes or Supplements. May be ex-library. Shipping & Handling by region. Buy with confidence, excellent customer service! 2006-09-03. New. Ships with Tracking Number! INTERNATIONAL WORLDWIDE Shipping available. Buy with confidence, excellent customer service! 2000-03-05. Good. Ships with Tracking Number! INTERNATIONAL WORLDWIDE Shipping available. May not contain Access Codes or Supplements. May be ex-library. Shipping & Handling by region. Buy with confidence, excellent customer service! 2008-01-04. New. Ships with Tracking Number! INTERNATIONAL WORLDWIDE Shipping available. Buy with confidence, excellent customer service!